Love or hate him, there is something to talk about the Venezuelan President. 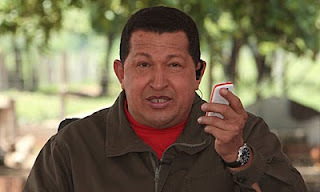 Chavez has been elected three times in a row. Even though his popularity has declined, he still holds a good chance of winning the next election. This is despite of Venezuela going through one of the worst economic times; the economy shrank by almost 2 % in 2010. Venezuela has now had more than eight consecutive quarters of falling GDP. This is at the time where all the Latin American countries are growing. According to Internet Stat today, Venezuela has 9,956,842 and a penetration rate 36% . As by time of this post, January 4th Chavez already has 1.1MM followers. This is about 10% of the of the internet user population in about 8 months. Chavez opened it account back April, 2010. Whether we agree or not that running a country on Twitter is a way to go. Chavez has made a case for using Twitter for political propaganda, public services, and social research. que padre que tengas un blog y estes agregando contenido en el internet. lo vi en tu facebook y me puse a ler unas notas tuyas...felicidades. asumo que al hacer el blog nos invitas a participar, por lo que te comparto mi opinion de esta nota tuya. tener 200 empleados para manejar una cuenta suena como mal uso de recursos y de tecnologia. justo el concepto de twitter es "one user to many users" que Chavez no esta aplicando. En su mayoria esta resolviendo casos que crean ruido y prensa. es decir propaganda que saca de contexto la realidad. el uso de twitter eficiente seria que el vea, confronte y resuelva problemas de profundidad y no que tenga a 200 personas revisando su cuenta para elejir los sensasionalistas. Bueno mi estimado, esa es mi opinion de este articulo..
te agradezco el foro que pones aqui para poder opinar y espero sigamos en contacto..
What is causing the revolt in Egypt?